The playground seems like the last place where you should be learning lessons, especially when the word itself implies that we are trying to get away from lessons as fast as possible. No, these lessons are not for my daughter. They are, instead, lessons she has taught me through her behaviour and her approach to simple situations amidst the swings, the sand, the monkey bars and the slides. Gy was at the park last week and eyed the monkey bars with longing. It is something that has always eluded her and she always shied away from trying it. Noticing this, I said, go ahead, give it a try. I promised her that I would stand and watch her. Gingerly, she climbed the ladder and tentatively tested the bars with one hand. Feeling enthused, she gripped it with both hands and swung away from the ladder. She stayed there for a few seconds and then dropped to the ground below. Her eyes shone as she turned and looked at me. I cheered, as was expected. Spurred on, she climbed back up and did it three more times. The fourth time, she released one arm and lunged forward to grab the next bar in the sequence and wonder of wonders, she stayed on the bars! I was flabbergasted that she had managed to master it in the space of a few minutes and was inspired by her ‘Never-give-up’ attitude. If you’re like me, you like your hands to stay clean. I don’t mean obsessively washing them with hand sanitiser at the sight of dirt, but staying clean. Gy revels in sand and loves the feel of it through her fingers. I like sand too. It’s easy to clean. Grime and dirt are another story, though. Once Gy had gotten the ‘hang’ of the swinging, she tried to move beyond the first two bars and couldn’t quite manage it. I stood by, chanting, ‘You can do it. Go on.’ Looking back I realise how utterly useless I was as a motivator. Given that this was the first time she had actually managed to swing across eight bars, it was but inevitable that she would lose her grip midway at some point. And fall she did, straight on to the sandy playground below. Her face twisted in pain and she tried to smile bravely through it as I went to help her stand up again. Gently, I asked her if she was all right and if she wanted to continue playing. Eyes glistening with tears, she gulped and said, ‘I just need a few minutes. I will be fine.’ True to her word, she took a short break and was back on the bars, swinging and laughing. After a couple of tries, she ran around the playground to show me that the pain had been temporary. Children and their fights on the playground are the stuff of legends. You know it and I have seen it at work. But what has always struck me is the speed at which children forgive each other. Within five minutes of making a new friend, Gy came to me with a morose expression, saying that A had fought with her. I sat there, silently and waited for her to figure out the solution. She sat by me and brooded for a few minutes and suddenly got up, ran back to A and said, ‘I am sorry. Shall we play again?’ And that was that. They were back to laughing and swinging side by side again. As the sun gently set on the horizon, shedding its pinkish-orange hues on the playground before me, lighting up the faces of carefree kids, I wondered, isn’t that what Life is all about? Of trying, of falling, of getting our hands dirty, of making friends and making up with them. Yet, we seem content to complicate these things way out of proportion. I may not have all the answers to parenting nor may I have the exact thing to say when Gy asks me a question. But, I know, that these five lessons on the playground will stand us all in good stead when we are facing the playground of Life. Here we will explore an aspect of positive parenting, a tool or a technique that has helped me in my journey. If you’ve visited before, you may be familiar with my Yelling Less journal. Have you learnt any life lessons from unexpected quarters? So thrilled to be leaving the first comment on your new domain ;). Very true Shailaja, these lessons would stand all of us in good stead. As we grow into adults, we tend to overcomplicate every transaction so very much. 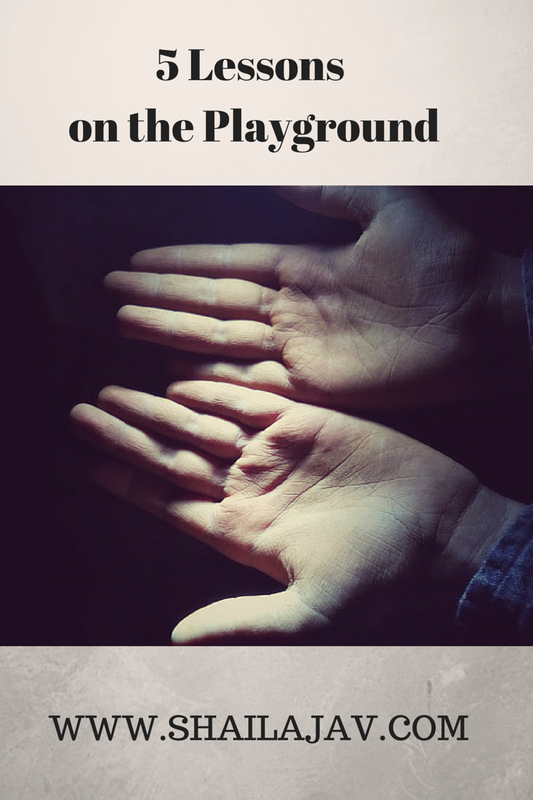 Kids and those playground lessons – always something new there, isn't it? Oh yes, many many lessons to be learned in the playground, and through our kids we all end up learning so much too. New domain? Congrats! Isn't it, Aparna? I mean, why the need for judgment and unhappiness when life can be and is so simple? Every single day, Sid. Every moment and every second, we find something to learn. Thank you for your kind encouragement, Monica. I love the way you unabashedly love Gy's updates and comment on my posts which resonate with you. The love and the sincerity is palpable. Thank you so much for your visit and the share, Carol. It's true that children do not see things through the filter of language, race, colour or preconceived judgment. So much more to learn. Thank you for such a thoughtful comment. I agree that there are lessons all around us if only we choose to pause and let them sink in to our conscious self. Wise words as always, Shailaja. So true that adults over complicate everything. We need to look to kids for what's important and how to handle situations. Wonderful post! Bravo to Gy mastering those bars! Such useful lessons Shailaja. It's interesting how kids seem to pick them up instinctively yet how easily we adults leave them behind as we grow. Thank you so much, Cat 🙂 I am glad you get where I come from. We do complicate things don't we? I am super proud of her for mastering those bars! Very true, Tulika. Our attention span for grudges seem to go on for too long, sadly.